Intertops Poker and Juicy Stakes are set to run a second set of multi-stage satellite online poker tournament series awarding prize packages into live main event games in the Caribbean. First up are the two three-tier series for main event seats into the upcoming Punta Cana Poker Classic, which is scheduled to run from October 25 to 31 at The Level At Melia Caribe Tropical in Punta Cana, Dominican Republic, and feature a prize pool of $500,000. Step-one satellites at both Juicy Stakes and Intertops Poker are due to begin on July 18 while the finals awarding prize packages worth $5,000 are set to take place on July 24. Online poker sites are running second set of three-tier online poker tournament series promising main event seats into the Punta Cana Poker Classic and the PPC Aruba World Championship 2016. 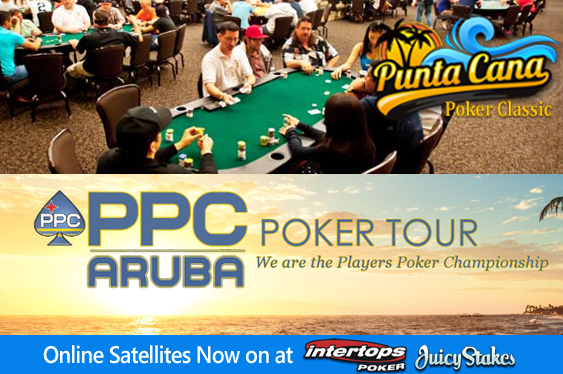 Juicy Stakes and Intertops Poker are additionally set to run a second set of three-tier multi-stage satellite online poker tournament series promising main event seats into the approaching PPC Aruba World Championship 2016. Scheduled to take place from November 2 to 7 at the Hilton Aruba Caribbean Resort And Casino, the PPC Aruba World Championship 2016 will feature a three-day main event from November 4 with a $500,000 guaranteed prize pool. Juicy Stakes and Intertops Poker declared that players can register for either of the three-tier competitions via their tournament tabs while winners are to join previous champions in having their experiences abroad featured on the Living The Dream blog.